Tourists in Bulgaria's second biggest city Plovdiv increased by 7% in 2013, compared to the previous year, reaching 14,261, data of National Statistical Institute shows. Plovdiv Municipality experts recorded an increase of individual visits of the city, as well as a 5% raise in museum visits, Standart news reports. 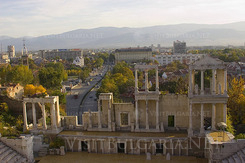 A 7-year strategy for tourism development Plovdiv 2014 - 2020 has been worked out in order to make full use of the existing cultural, historical and natural resources in the city. The strategy foresees events aimed at the creation, promotion and marketing of tourist packages, including cultural, business, wine and gourmet, sports and weekend products. The 'Tourism' Operational Program has already developed two packages that have been offered to tour operators and will soon be available on the market.